This luxury beachfront condo is located in the Crescent Beach Community of the Palmas del Mar Resort. It is a ground level, comfortable and spacious 2 bedroom, 1 bath home. It is tastefully decorated and furnished throughout. The oceanfacing balcony provides for fantastic views of the pool and the beach at Palmas del Mar. The home includes all the amenities to ensure your stay is as comfortable as possible. A luxury 2 bedroom (King Master bedroom, 2 Twin size beds in 2nd Bedroom, & full size sofa bed in living room), 1 bath, ground level condo with fully equipped kitchen, Air conditioning, Cable TV w/VCR, all bed linens, secure off-street parking, a balcony/terrace with pool and ocean views, located in the quiet, gated, and secured community of Crescent Beach at Palmas del Mar in Humacao Puerto Rico. Rates: daily rate: Please call for rates. Note: Rates are subject to change during peak periods (X-mas Holidays & Presidents Day Weekend), please contact for prices. 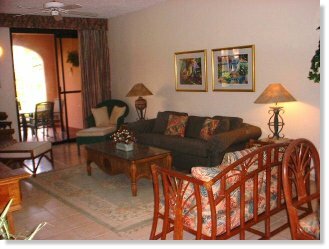 This beachfront puerto rico vacation rental home is located in the beautiful Palmas del Mar Community of Crescent Beach. The beach here is an excellent swimming and watersports beach. It is also a good snorkeling beach on calm days. Or just sit back and relax in you own covered balcony, and enjoy the surf and the beautiful views each day. This home offers all the amenites you expect in a relaxing vacation. There are two excellent golf courses, horseback riding, and tennis facilities at the resort. The hotel nearby offers other amenities such as a gambling casino, spa, restaurants, and other conveniences. A grocery store and restaurants are also nearby. Facilities that offer deep sea fishing, scuba diving, and other watersports services are also nearby.